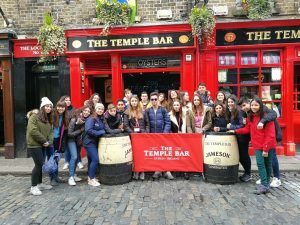 A trip to Dublin would not be complete without spending some time in the city’s famed Temple Bar area. This vibrant area is filled with bars and restaurants, cobbled pathways and it is renowned for being the cultural quarter of the city. 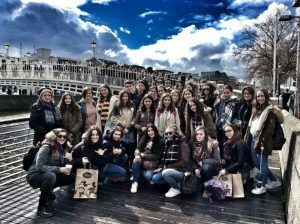 Some of our students taking an opportunity for a photograph on their trip to Dublin City. 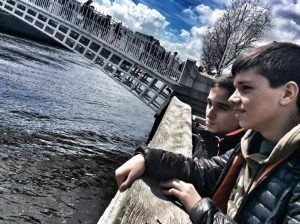 Here they are standing in front of the Ha’penny Bridge, and then officially the Liffey Bridge. It is a pedestrian Bridge built in May 1816 over the River Liffey in Dublin. The bridge is 43 metres long and 3.66 metres wide. It is estimated that 30,000 people cross the footbridge every day. For 184 years it was the city’s only pedestrian bridge across the Liffey. The River Liffey flows through central Dublin. The river was called ‘An Ruirthech’ in Irish, meaning “fast (or strong) runner” before it was called Liffey. It is the 8th longest river in Ireland. It major tributaries are the River Dodder, River Poddle and River Camac. The river supplies much of Dublin’s water and a range of recreational activities. 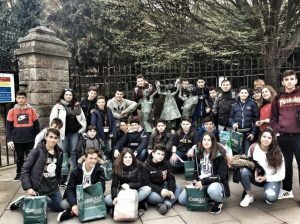 Our students regularly enjoy a stroll around St. Stephens Green park filled with lovely pathways, ponds and fountains located in the heart of the city. Particularly in the summer time it’s a popular location for people to enjoy the sunshine. 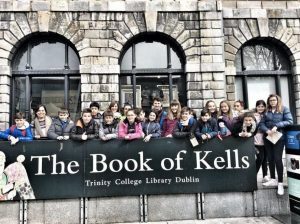 The students visit Trinity College to see the famous Book of Kells, which is an illuminated manuscript, gospel Latin book. 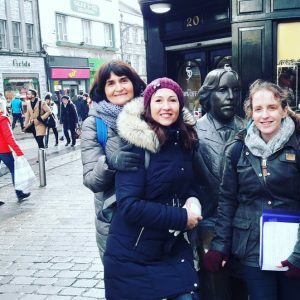 Our leaders and a Teacher from Shannon Academy on Grafton street, during a day trip to Dublin City. Grafton street in a closed pedestrianised area from Trinity College to St. Stephens Green with high end boutiques, cafes, restaurants and tourist shops. A visit to Ireland would not be complete without a trip to Dublin city. Whilst there is the usual hustle and bustle of any other city, it is worth it to visit some of the capitals most famous attractions. Athlone is “where it’s at” this St Patrick’s Weekend! Caoimhe is flexible and willing to work on any project she assumes and adapt herself to possible changes. Learn English in Ireland © 2018 All rights reserved.